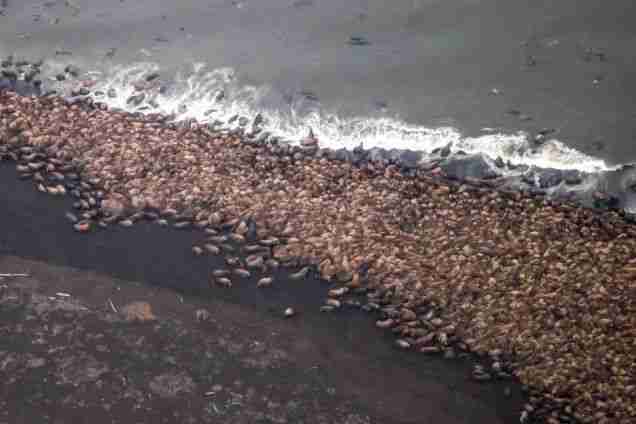 A staggering sight was photographed on Saturday, September 27 as biologists witnessed roughly 35,000 Pacific walruses gathered on the shore about five miles north of Point Lay, Alaska. The National Oceanic and Atmospheric Administration conducted the survey, and the amount of walruses was over triple the amount seen in the same area this time last year. 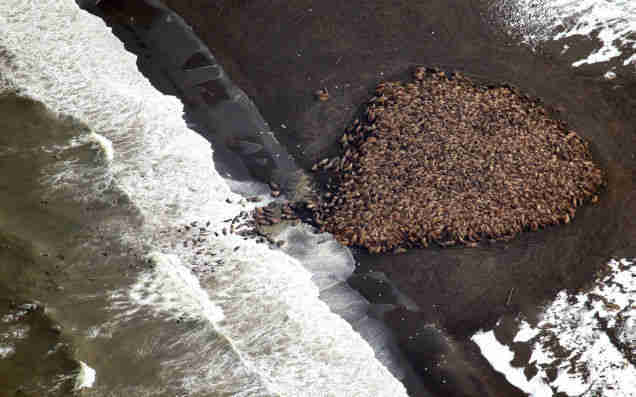 In September of 2013, the number of walruses observed near Point Lay was estimated to be between 8,000 and 10,000. The drastic increase in resting walrus numbers is a grave concern, as it is probable that climate change is responsible. 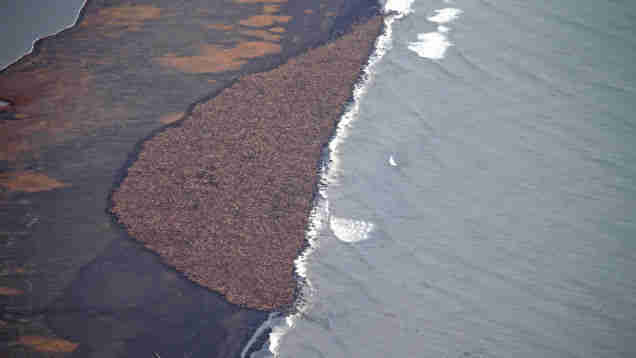 A decrease in the amount of floating ice in the Chukchi Sea has forced more walruses to find rest on dry land. "The massive concentration of walruses onshore - when they should be scattered broadly in ice-covered waters - is just one example of the impacts of climate change on the distribution of marine species in the Arctic," said Margaret Williams, the director of the World Wildlife Fund's Arctic program, in a statement to the Associated Press. "The walruses are telling us what the polar bears have told us and what many indigenous people have told us in the high Arctic, and that is that the Arctic environment is changing extremely rapidly and it is time for the rest of the world to take notice and also to take action to address the root causes of climate change." Sea ice in the Chukchi Sea has been in decline for decades - the US Geological Survey says that "in 6 of the last 9 years, the Chukchi Sea shelf was ice-free-with periods of no ice cover extending from 1 week to as much as 2.5 months. In contrast, there was always some ice over the Chukchi Sea shelf in all of the previous 20 years." Not having enough floating ice to rest on can be dangerous for walruses. "With less sea ice, walruses will likely spend more time on shore haulouts along the Russian and Alaskan coasts where foraging trips may be more limited to foraging grounds nearby. Calves and yearlings suffer increased mortality on terrestrial haulouts when disturbances cause the herd to panic and rush to the water running over and crushing the smaller animals," the Alaska Department of Fish and Game writes. The loss of sea ice also means that walrus mothers cannot leave their young on the floating ice in order to find food, thereby greatly reducing foraging opportunities for the species. It's possible that stampeding has already caused considerable fatalities at Point Lay. US Fish and Wildlife Service spokesperson Andrea Medeiros said that the agency was assembling a necropsy team to determine the cause of death behind roughly 50 walrus carcasses that have been spotted on the beach. In the midst of this sea ice crisis, the US Fish and Wildlife Service is currently considering listing the Pacific walrus as an endangered species.